NBA player Dwight Howard, and Rihanna team up and endorse their 'Tweet then Delete' movement on Twitter. Athletes and Artists are urging fans to show their short-lived heartache with a two minute tweet of the hashtag #FreePalestine. Fans are then instructed to delete those gut reaction tweets, and then either replace them with meaningless tweets, or ones that are more Israel-friendly. I apologize if I offended anyone with my previous tweet, it was a mistake! “At first, I saw images of small children blown up to bits, and I was like – ‘That’s messed up!’ So I tweeted #FreePalestine,” said the 28-year-old center for the Houston Rockets. Howard urges people to do the same thing he did, which per Howard, is to tweet a call for more humane treatment of a civilian population, wait for an executive or fan-base to tell you how crazy you are for feeling that way, and then replace the original tweet with an apology. At the time, Howard’s testicles were being squeezed by two men in suits. 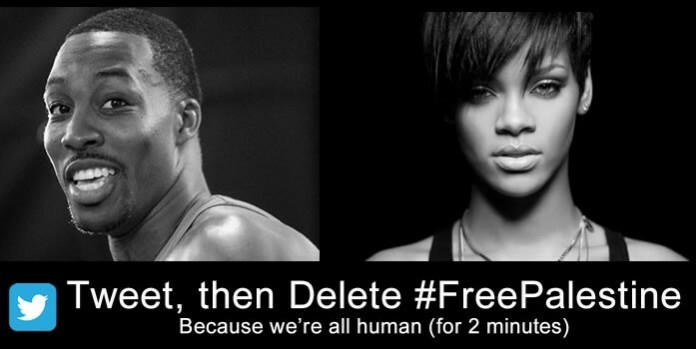 Rihanna, who also participated in the ‘Tweet then Delete’ campaign, outlined the strategy. “There’s a moment between feeling deeply saddened by the horrific scenes of women and children being killed… and your agent telling you to shut the f$%^ up. It’s in that moment that we all can ‘Tweet then Delete. '” said the Grammy award winning artist from Barbados. Numerous celebrities are expected to participate in ‘Tweet then Delete’ over the next few days.